Campbell Scientific recently supplied agrometeorological stations for an important research project in Costa Rica. 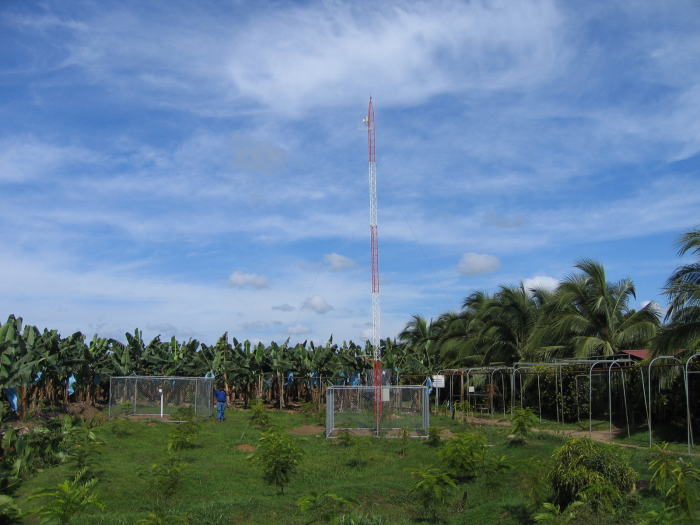 The project involves a network of seven automatic agrometeorological stations installed at banana plantations on the Atlantic Coast of Costa Rica. The network makes use of a Mikrotic Wi-Fi system for data transmission, which not only allows connections to the stations, but also provides mail services, Internet, and VoIP at the field offices. The system was ordered by REICO, a company that manages networks of data in Costa Rica for the National Banana Corporation (CORBANA), the leading banana industry organization in Costa Rica. CORBANA is a public entity, not state-owned, and its stocks are equally owned by the central government of Costa Rica, three state banks, and all banana producers. The Costa Rican banana industry has achieved outstanding successes in this area of research, working with extreme scientific rigor in areas such as fertility and nutrition, phytopathalogy, nematology, cultivation of textiles, soils and drainages, microbiology of soils, and agronomy. By means of this new network of Campbell Scientific agrometeorological stations, CORBANA will be able to relate environmental parameters—like rain, direction and velocity of wind, ambient temperature and relative humidity, solar radiation, ground temperature, and leaf wetness—to all of the problems of planting, irrigation, fertilization, disease, and banana production. Additionally, CORBANA has a specialized office for weather forecasts and can give statistical information that is used at each plantation to take pertinent precautionary measures. The stations are located at strategic farms covering a great area of Costa Rica traditionally dedicated to the cultivation of this fruit.